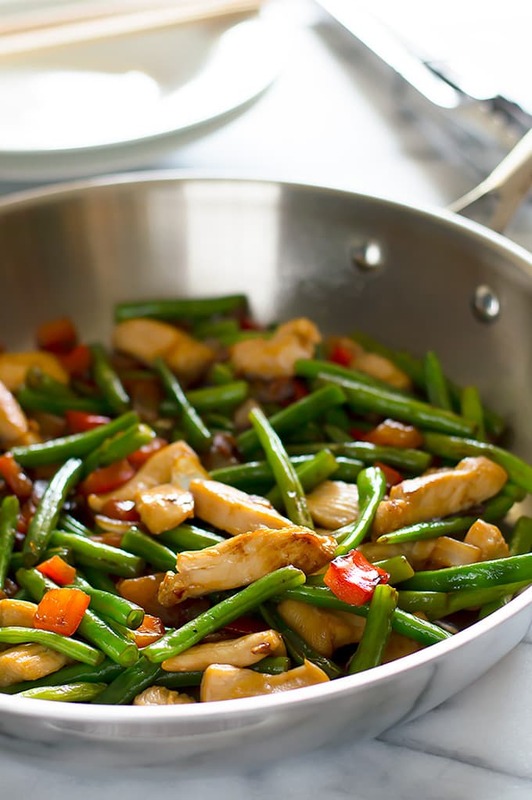 This Panda Express-Inspired String Bean Chicken is light, simple, and delicious. If you’re looking for a healthy dinner for two, look no further! Happy 2017! How was your New Years Eve? We’re back for another year of recipes, and as is tradition, recipes on the blog this month will be on the lighter side. You might remember last January’s salad series where I posted some of my favorite healthy salads like my BLT Salad and Asian Chicken Salad (if you haven’t tried those salads, you totally should–they are THE BEST). This year I don’t I have any January salads for you, but I do have lots of my favorite healthy dinners and lighter desserts scheduled that I can’t wait to share. Things may as well be delicious while we all recover from the smorgasbord that was December. First up is my favorite Panda Express Copycat recipe around, String Bean Chicken. I know. I know. 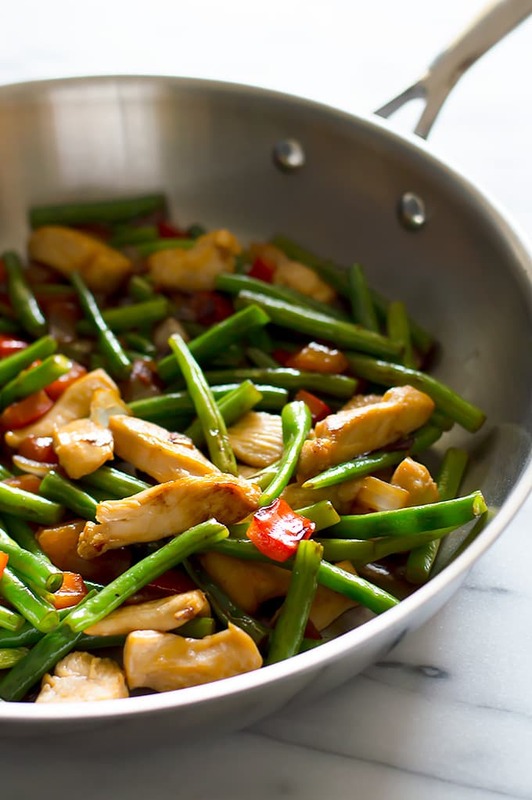 You hear fast food-inspired and do not think light and healthy, but this String Bean Chicken is made with lean and light boneless skinless chicken breast and packed full of green beans and bell peppers. It’s a cinch to throw together and SO good. 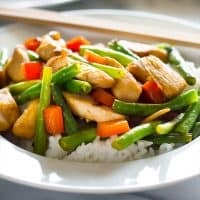 My sister introduced me to this recipe a few years ago, and aside from my Teriyaki Chicken, it’s the Asian-inspired recipe that I make the most often. Mostly because it’s delicious, but also because everything can be cut and prepped ahead of time, so it’s a perfect weeknight meal. Chop and mix everything over the weekend, and then day of, just pour the marinade over the chicken in the morning, and that evening, everything cooks up in about 15 minutes. That means that not only is this Panda Express-style String Bean Chicken that tastes better than takeout, but it’s FASTER too. As written, this String Bean Chicken recipe generously serves 2. To change the recipe yield, hover over the number of servings (or click if you are on mobile) and slide the slider–no preparation changes are necessary for doubling. 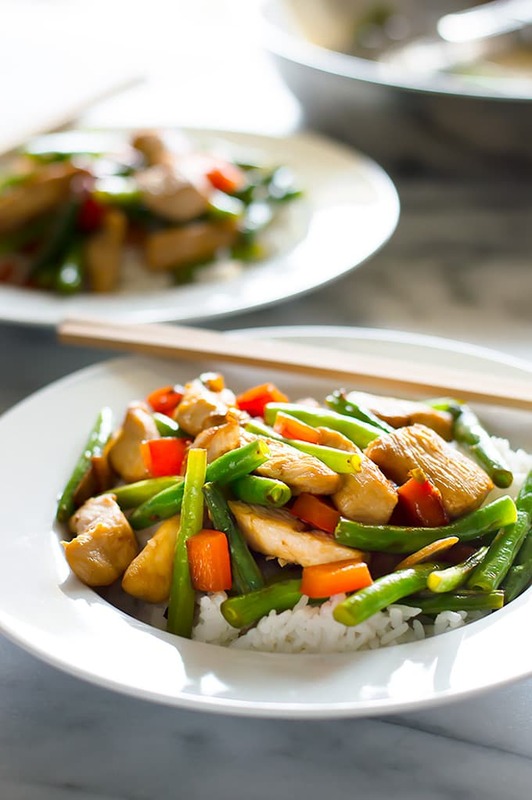 This Panda Express-Inspired String Bean Chicken is light, simple, and delicious. If you're looking for a healthy dinner for two, look no further! In a small bowl, stir together cornstarch, sugar, soy sauce, and toasted sesame oil. Place cubed chicken in a disposable plastic bag and pour mixture over the top. Toss to coat. Allow to marinate for at least 15 minutes, up to 12 hours. In a medium wok or saute pan (with a lid), heat oil over medium high heat. Once hot, add chicken and cook until cooked through. Transfer chicken to a plate and tent with foil to keep warm. Return pan to heat. Deglaze with a couple tablespoons of the water and add onion and garlic. Cook for three minutes, until onion just begins to turn translucent around the edges. Add green beans and bell pepper and cook for another three minutes. Add 2 tablespoons of the water, cover, and continue to cook until vegetables reach your desired level of doneness, adding more water as necessary, about 3 to 8 minutes*. Stir in chicken and cook just until chicken is hot. Salt to taste. *Panda vegetables are usually cooked until quite soft. This can take a little while on the stove. Just keep adding a couple tablespoons of water, cover and cook for 2 to 3 minutes, check and repeat if necessary. Don't be worried if it seems to take a while for the green beans to reach the texture you are looking for. Toasted sesame oil is a popular ingredient in many Asian dishes. It's generally cheap and lasts for ages. If you have regular sesame oil, you can toast the oil yourself or use it as is. It will lack the distinct deep, nutty flavor of the toasted variety, but is still delicious! Approximate nutritional information does not include rice.